@Victor. Interesting review. Having never had a 100% corn whiskey, how do they differ from a high corn bourbon? I wouldn't call 1021 listed at the KGBO "scarce", but I saw 400 bottles of the Laddie 10 disappear in a matter of months. I have my 2 bottles. This is definitely good stuff. Thanks @paddockjudge for the taste. @Benancio, well, unlike bourbon, corn whisk(e)y has no rye grain or wheat grain to overshadow the flavours of the corn. This makes it a lot more possible to actually taste corn. In the case of this reviewed Canadian corn whisky, the wood aging is from used wood, which also diminishes the wood flavours (vis a vis bourbon) thus also allowing the corn flavours to shine through more brightly. There are of course examples of a very high corn content US whiskeys which are not necessarily labelled "corn whiskey", though maybe they should be,...such as George Dickel Barrel Select Tennessee Whisky, which is probably significantly above 80% corn content. @Nozinan, 1,021 bottles in Ontario may mean a total of 3 or 4 or 5,000 bottles in all of Canada. Since there are approximately zero bottles outside of Canada, I don't consider that to be very many bottles available, worldwide. With 20 year old whisky, once it is gone, it is usually a slow replacement process. 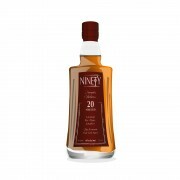 If the Canadian supply of Ninety 20 yo were available to a robust world demand a few thousand bottles could disappear in a few months, never to reappear. The only reason 5,000 bottles can seem like a lot is that there is not currently a large demand for this product. I remember well 4 years ago when I could buy large numbers of bottles of Elijah Craig 18 yo at $ 35 per bottle. Can't find a one of them for sale anymore. @Benancio, slight amendment: THIS reviewed corn whisky has no other grains in it to compete with the taste of corn. Corn whisky as a genre, especially US corn whiskey, may have small amounts of rye or wheat present. The US legal requirement to call it 'corn whiskey' is a minimum of 80% corn content. @victor, your point is well-made. What may seem plentiful is not always so. I'm happy to put away one or two for anyone who has no access and does have reasonable chance of coming to Ontario in the next year or 2. This whisky very nearly became extinct when in June of 2013 the High River overflowed its banks and caused heavy damage to Highwood Distillery. All Equipment and finished goods in the complex were compromised and subsequently destroyed to prevent against contamination (and unnecessary taxes). This Release could easily have been called Phoenix, Resurrection, or Serendipity. It was simply good fortune which saved the barrels of sleeping whisky in the slightly higher elevated end of the warehouse. The loss of aging stocks might have marked the end of Highwood/Century Distillery. @Paddockjudge, I always find that a history lesson enhances the enjoyment of any dram. Thanks for adding that information.